I have a confession...I struggle with hanging pictures on my walls. I pin all these beautiful gallery walls and DIY art on Pinterest, but I never do anything about it. That changes this month! I am back with the Craft Room De-Stash Challenge to use up some of my craft supplies I have on hand and make an easy monogrammed canvas wall art for my entry way. I have had this white canvas for months, trying to decide what to do with it. I was mostly afraid of messing it up and having to throw it in the trash. After scouring Pinterest and finding some ideas, I figured it was time to do something with this canvas! Measure out how wide you want your stripes to be and make a light mark on the edge of the canvas using a pencil. 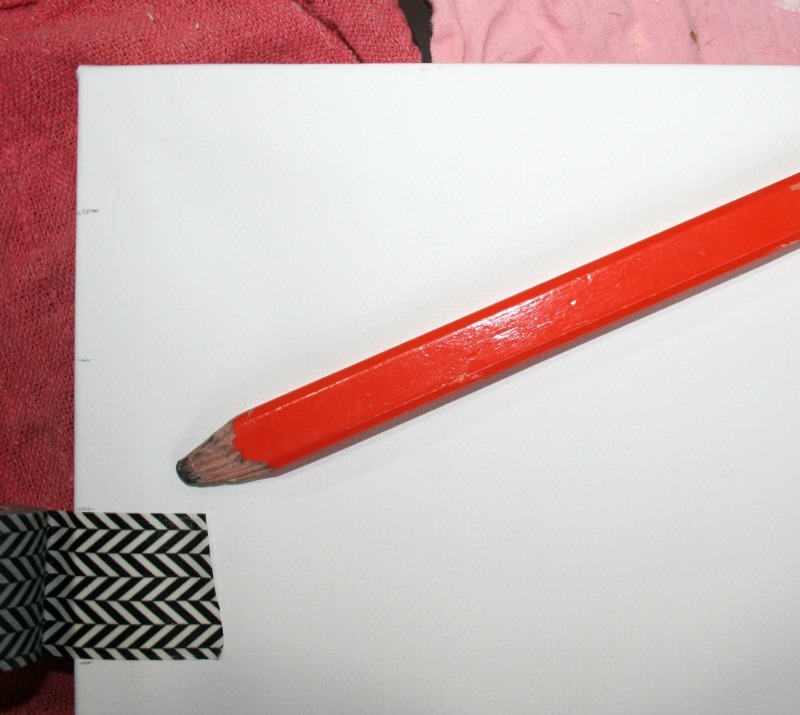 I spaced mine as wide as the washi tape I was using. Mark off the sections that you are NOT going to paint using your washi tape or painters tape. 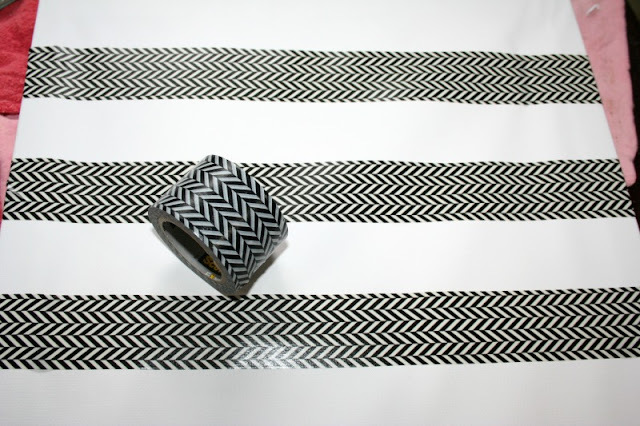 Run your fingernail over the edges of the tape to ensure a good seal, so paint does not bleed under the tape. 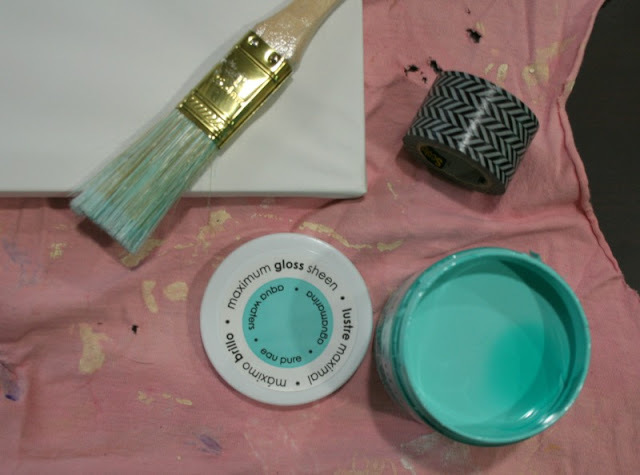 Paint the exposed areas using a small brush. 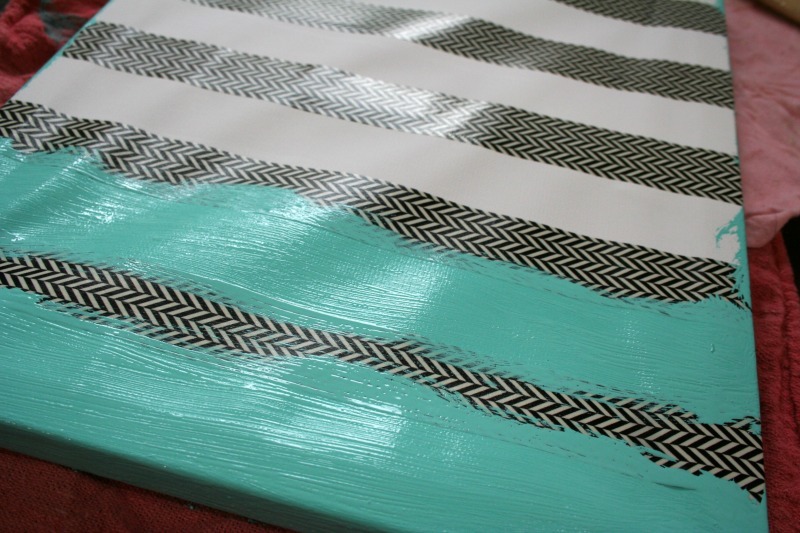 I used Gloss Turquoise by Deco Art. Let dry for a few hours, then remove the tape from the canvas. 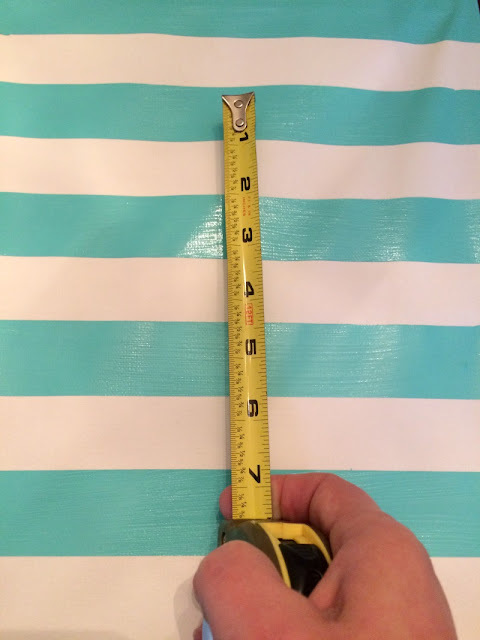 Use a tape measure to decide how large you want your monogram to be. I decided to make mine about 7" tall. 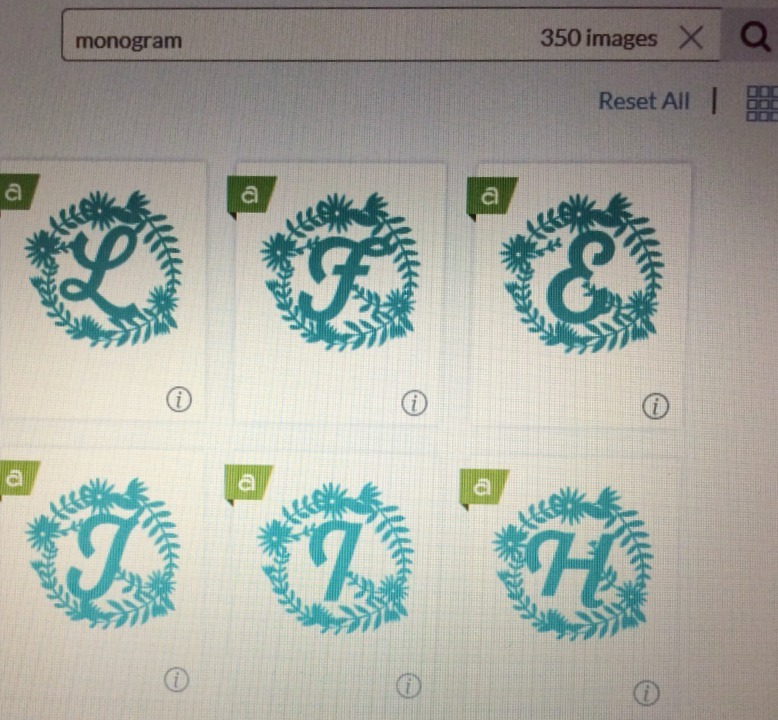 In the Cricut Design space, I searched on "Monograms" and filtered the results on Free and Cricut Access. I chose a monogram design with a circle design around it. Drag the handles at the edge to resize the design to your desired size. 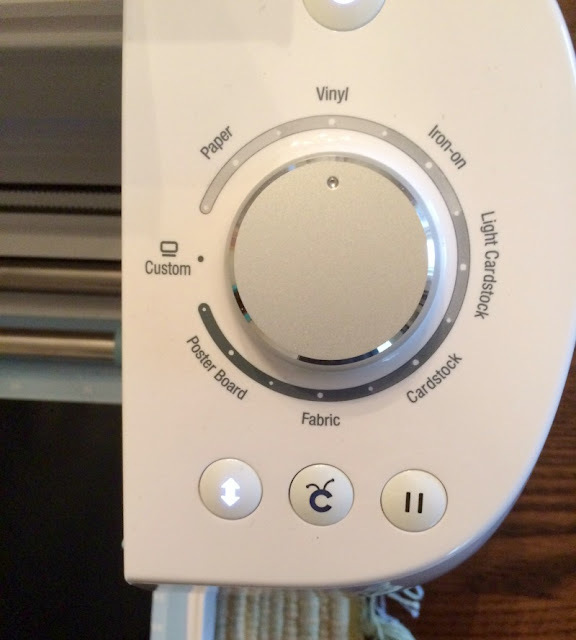 Place your vinyl on the mat, load it into your Cricut machine, and set the dial to Vinyl. 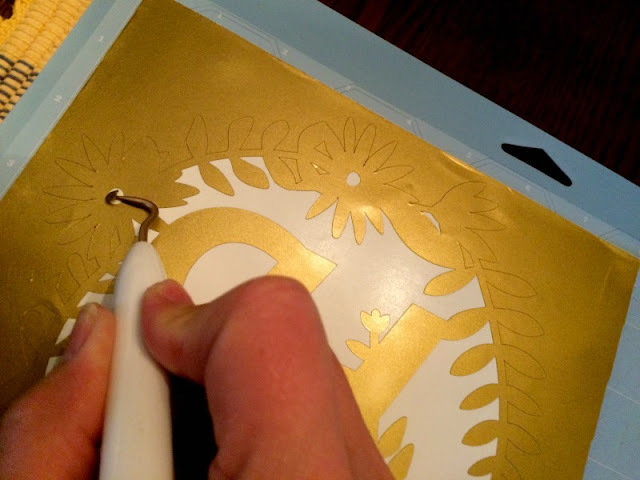 Carefully weed the vinyl from the design, taking care not to rip any of the delicate pieces. 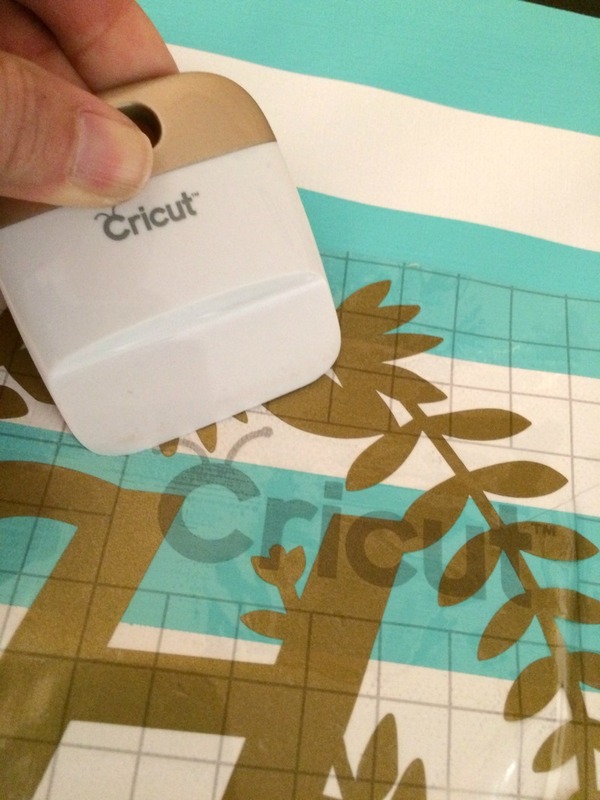 Cut a piece of transfer tape in the same size as your design place it over the monogram cut, smoothing out the wrinkles. 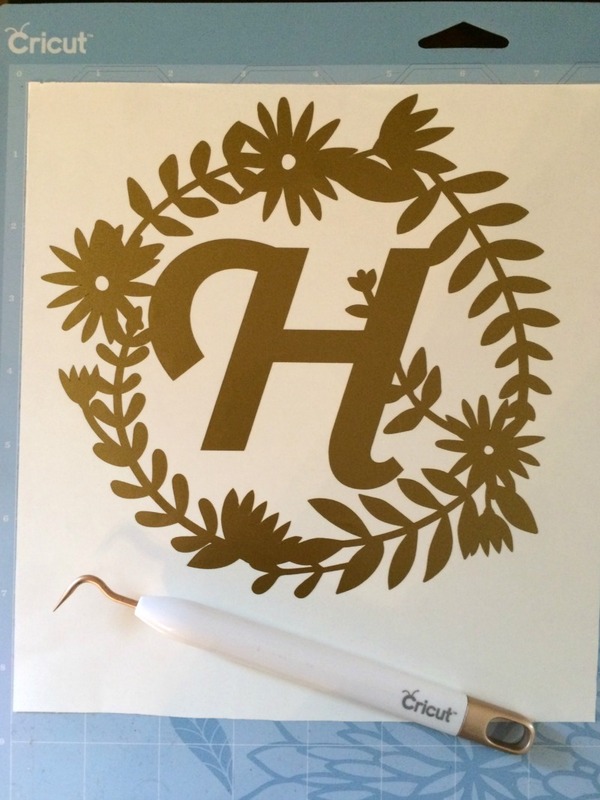 Place it on your canvas in the appropriate spot and press down on the vinyl to make it transfer to the canvas. I use my flat Cricut tool to smooth it out. Peel back the transfer tape slowly, making sure the vinyl has adhered to your canvas. Admire your beautiful new DIY monogrammed canvas wall art and hang for everyone to see! 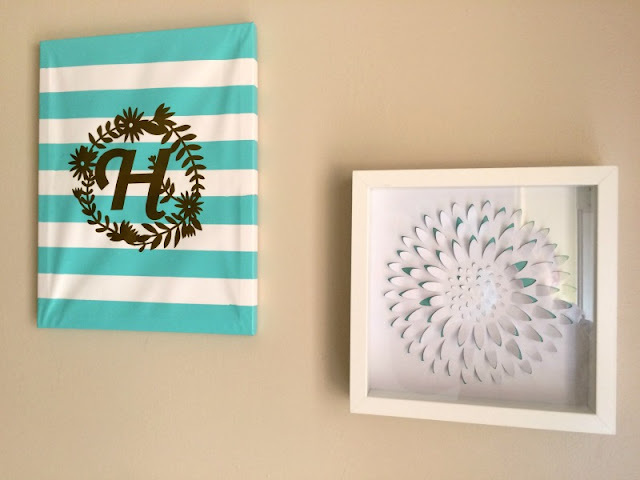 I hung mine in my front entry by my 3-D Flower shadow box art I also made with my Cricut. 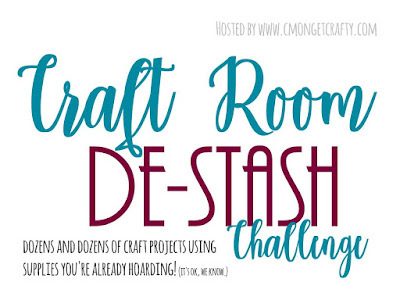 I hope you will visit the other bloggers to see what they used up from their stash this month. Just click the pictures below and let me know what your favorite project is! See ya next month! I love this canvas wall art! The colors are so pretty together! Great project! Thank you! I was a little unsure about the gold, but loved how it turned out! I love how this looks. I really need to get a Circut. I like the colors of the stripes and how the monogram stands out. Thank you! 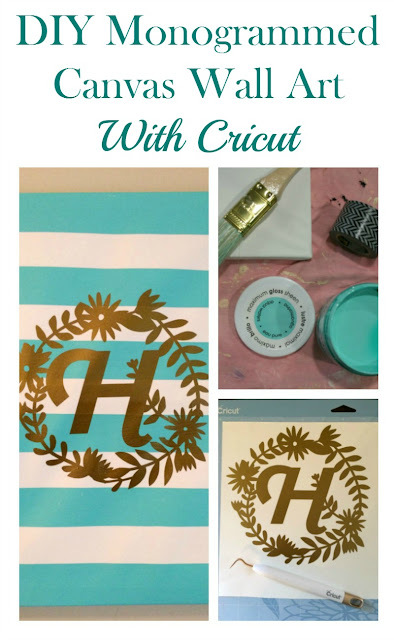 The Cricut is truly amazing! You can use it for so much! I love both of these projects, Mary, but the 3D Flower really speaks to me. SO fabulous! Thank you Jennie! The 3D flower is one of my faves too! I don't have a Circut, but I have a Silhouette that I could use to do this. 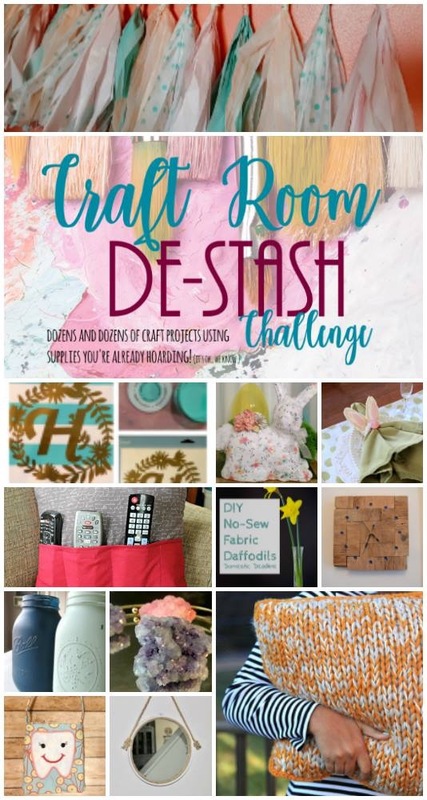 Fun project and this would be great to place on the kids' bedroom doors. Yes! You could definitely make this with your Silhoutte! The combination of the aqua and gold is so striking, I love it! Thanks Megan! It turned out so much better than I imagined! Love how your canvas turned out. Very pretty color choices. Thank you! I was not sure about the gold initially. This is adorable. Love the colors and simplicity of the project. I'll be making this for my daughter's room. THank you! I need to make more wall art, it was so easy! Such a cute idea!! I love the aqua colour you chose! It really makes the gold pop! Thank you! Aqua is my favorite color! Thank you! I hope you make one and thank you for inviting me to your link up! 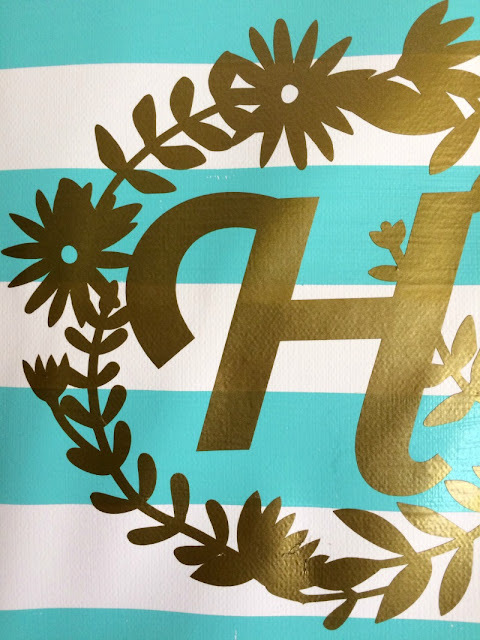 Love the colors of this piece, especially with the gold monogram. Great job! Thanks! 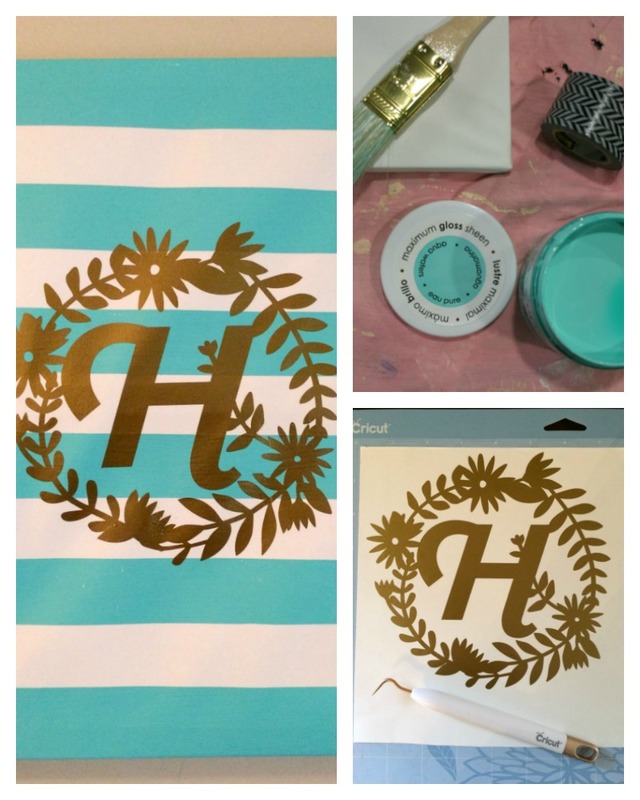 I love how the monogram turned out! Great idea! My sister just got a Cricut, and I have plenty of canvas. I would a be fun weekend project for us to do together. Thanks for sharing your tutorial! Pinned! Thanks for pinning! I hope you will tag me on social media if you post a pic of your project, so I can see it! I need some inspiration for some other art!